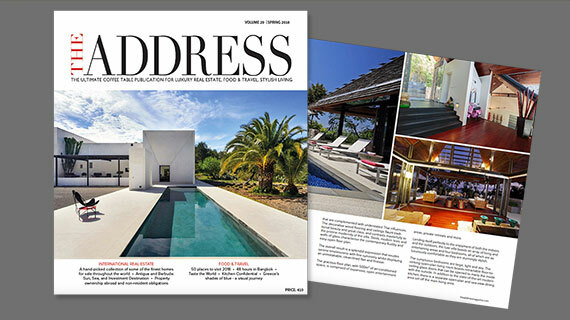 Independent and unbiased, THE ADDRESS Magazine provides a highly efficient, personalised and discreet property finder service. TA Dedicated Property Finder offers a Property Search Service for its subscribers who often have little or no time to spend searching for property and who require efficiency and sound advice. We provide a dedicated search service for both Private and Corporate Clients who wish to purchase residential property, a second home, a holiday home or a retirement home throughout the world. Our scope is global, covering a diverse range of styles and destinations such as a holiday home in the Caribbean, a chateau in France, a penthouse in New York, a townhouse in London, a plot of land in Asia or a private island in the Pacific. We work with agencies, developers and private owners in order to locate the properties that best meet your brief. Our inside knowledge means we may also be able to present exclusive, off-market properties. The first step is to fully understand your requirements and timescales. Simply fill in the online form with as much detail as possible and submit the form. We will then review the information and if anything is unclear, or if you have any questions, we may also have telephone discussion. Once we have agreed on the brief, we will use every possible contact to find the ‘right’ property. We put integrity and impartiality at the heart of what we do and we are driven by and motivated to achieve results, taking great pride in finding the perfect property for our readers. When we do a search, our sole focus is to find you the perfect property at the best possible price in minimum time and with minimum hassle.